When introducing dog and cat, first impressions are important. The key is to go as slowly as it takes to keep fear and aggression at a minimum. It’s likely that you’ll see some of both, but if you’re careful, you can check it before it snowballs. Keep going over each step until it’s old hat to both animals, and if either gets frightened or overly excited, just go back to the previous step and keep practicing until they’re calm again. This process may take days, or it may take months. 1. Get them used to each other’s scent. Rub a cloth on each pet and put it in the other’s hang-out spot — on the dog bed, under the cat’s food dish, on your lap. You may have to refresh the cloth with the animal’s scent several times. Keep it up until neither one seems overly excited or distressed by the other’s smell — barking and whining in your dog and a swishing tail in your cat are signs they need more time. 2. Let them investigate each other’s living areas. While the cat’s outside or elsewhere in the house, bring the dog in to sniff around her lair, and vice versa. This way they can explore the other’s territory and scent without a direct face-off. 3. Introduce them through a door or baby gate. Bring the dog and cat on opposite sides of a closed door or baby gate, with a person on both sides. Don’t restrain your cat at all; feeling like she can’t get away may frighten her. Let them sniff under the door or through the gate, but if your cat doesn’t want to get too close, don’t force her. Lavish them both with praise, attention, and treats. You want them to think that good things happen when the other pet is around. Ask the dog to sit, lie down, and perform any other commands he knows, praising and rewarding him whenever he focuses on you and not the cat. Keep practicing this step until the cat doesn’t seem frightened and the dog doesn’t seem overly excited. 4. Introduce them with the dog on leash. Again, don’t restrain the cat — she may panic if she feels like she can’t escape this new, scary creature. Keep the dog on leash so you can stop him if he tries to give chase. Again, ask the dog to obey some commands, rewarding him for focusing on you rather than on the cat. 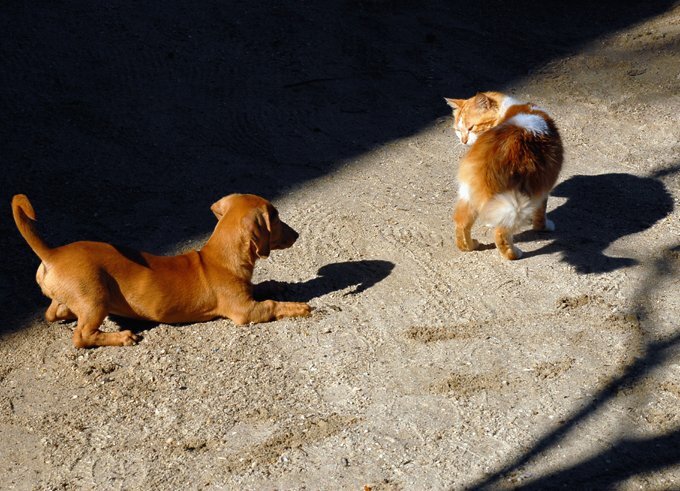 Some cats will hiss and swipe at a curious or obnoxious dog to warn him, “Back off!” That’s actually a better response than running away, which often triggers the dog to take off after her. If the cat flees and your dog starts to chase her, grab the leash, firmly tell your dog, “No” or “Leave it,” and ask him to sit. If he returns his attention to you, give him a food reward — a really tasty one — for his restraint. Once your dog and cat seem fairly comfortable in each other’s company, you can let them roam around together when you’re home. But it’s wise to separate them in different areas of the house when you go out until you’re very, very sure they’ll get along. Some experts recommend making this a permanent policy, to keep all the pets safe. Bottom line: Many dogs and cats can coexist peacefully, but you’ll keep everyone safe and make life much less stressful if you plan carefully when looking for a new pet, and introduce the newcomer slowly and carefully.